A 12-volt battery is the type you find most frequently on motorcycles and electric lawn equipment, so if you're going to use a voltmeter on any 12V system or power source, this is the most likely candidate. Although you can use a dedicated voltmeter for this, you're more likely to use a multimeter. Measuring voltage is only one of its functions. The others are measuring resistance and current, so you have to select the proper function on the dial as well as the appropriate scale. Besides this, you need to observe a few simple precautions, the main ones being to wear eye protection and to avoid measuring voltage on a battery that was fully charged less than a hour before you make the measurement. The dial selections on a multimeter are divided into three groups. One is resistance, which is often denoted by the capital Greek letter omega (Ω), and another is current, which is usually denoted by a capital A (for amperes). The one you want is voltage, denoted by V. You'll find several settings in the voltage group representing a progression in sensitivity from 200 millivolts (mV) to 500 volts. The dial selections may also include settings for DC and AC voltage. DC voltage is denoted by a straight line, or no line at all, while AC voltage is denoted by a wavy line. To measure voltage in a 12V system, you want to turn the dial to select DC voltage in the 20V range. Before measuring voltage on a battery, it's a good idea to disconnect it from the circuit by removing the battery cables. This minimizes the chances of a stray current draw affecting your reading. Plug the red lead that comes with the meter into the VΩ port and the black lead into the common (COM) port. Touch the black lead to the negative (-) terminal on the battery and the red lead to the positive (+) terminal. Note the reading on the meter. It tells you the voltage between the battery terminals. If the battery is good, the reading should actually be higher than 12 volts. It should be somewhere between 12.8 volts (fully charged) and 12.1 volts (50 percent charged). The battery is not charged, and could be bad, if the reading is 11.9 volts or lower. You can conduct two other voltage tests on a 12V battery that powers a motorcycle or lawn mower. To do this, you'll need alligator clips on the voltmeter leads or a helper. To test starting voltage, connect the battery cables, then hold the leads on the terminals while you start the ignition. It's normal for the voltage to drop when you do this, but it shouldn't drop any lower than 9.5 volts. If it does, the battery needs to be replaced. To test the charging system, hold the voltmeter leads on the battery terminals while you rev the engine to about 3,000 rpm. The voltage should rise to a value between 13.8 and 14.5 volts, which is the minimum voltage needed to charge a typical 12V battery. If the meter does not indicate this much voltage, look for a problem in the charging system. Yuasa: How Do I Test My 12 Volt Battery and Charging System? Deziel, Chris. "How to Use a Voltmeter on a 12 Volt." 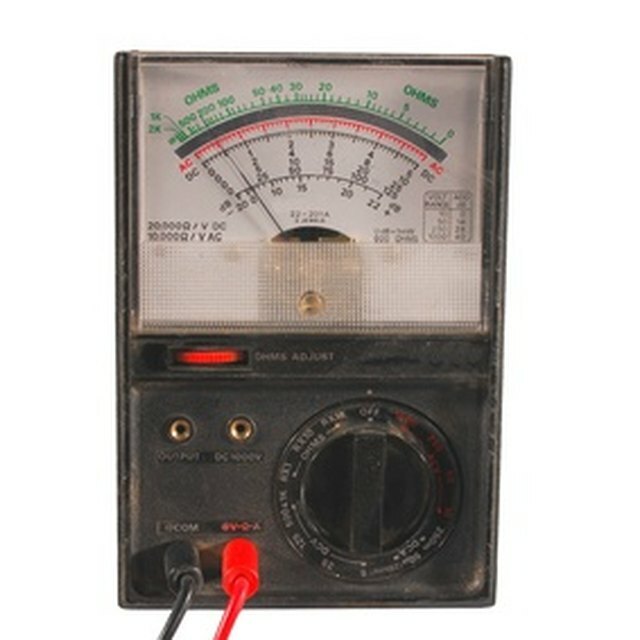 Sciencing, https://sciencing.com/use-voltmeter-volt-5542242.html. 20 May 2018.